Let this tutorial lead you through every step and soon you'll know how to make a fabric box. 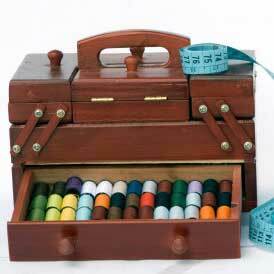 Use your decorative fabric box to organize children's toys, your sewing supplies or other clutter around the house. This fabric box pattern is cute and useful! Fabric Storage Boxes are as sturdy as they are cute. There is no better way to de-clutter your home than to tuck things away. If everything has somewhere to live, you won’t leave it sitting out. Use this how to make fabric boxes to tutorial in your craft room, kitchen, kid’s room, or really anywhere in your house! Wow! This looks very professional and totally not DIY. With that skill and creativity, you should be making these for sale. They would look amazing in one of those IKEA type shelves for organising your fabric and yarn stash. This box keeps everything neat and in its place away from direct sun and dust. It would be nice to have a lid on it though. Anyone willing to make this has ample directions with photos of each stage along the way. I have been looking for that certain box to put my grand daughters headbands in but can not find what I like so I was trying to decide what to make and then I saw this. I wanted something sturdy and these boxes you buy in store(which I have many)are not strong enough. They already broke and I can not find any with fabric I like. These fabric boxes can be made to your desired size too. I wondered how to make them more sturdier and I never thought of plastic canvas. Now I will have to make some for things around the house. Great tutorial. This is by far, one of the best fabric storage boxes patterns I would like to learn to make. The design is one I consider appears it is made by a professional seasoned sewer. I especially like the project I shall use for my sewing patterns, notions, etc. I made 3 of these to place on shelves in my sewing room. They look great and I found all materials except for the plastic canvas in my stash. And they were fun to make. Thanks for the great idea. You are 100% correct. If I wanted to buy, I wouldn't look here! I'd much rather look for stuff to personalize a project, save money, & use up some of my stash. My problem is I love most of my stash & hate to use it up! LOL! Stupid, huh? Thanks for the comment, I plan to try these. I think it's awesome. I have most of the stuff on hand to make this. If you go to craft stores; you'll pay quite a bit for something like this and that's even with the 40% off coupon. I LOVE, LOVE the pattern and it might take me a little longer; it's worth it! Great job! I love the pattern. Perhaps my sewing skills aren't what they used to be since it has been a while. But this is more than an evening's work for me. Likely this is a weekend project. Love the idea and my granddaughters should love their boxes! Well, I think this is way too much work for containers that don't even have a lid!! Go to a resale shop and buy something!!! In my area we have fantastic resale shops (Schaumburg IL) that sell EVERYTHING at extremely reasonable prices. How fortunate you are to have some fantastic resale shops in your area. There is only one such shop in mine, and it's not that great, nor are the prices reasonable. Also, it will be closing soon; or so I've heard. The other thing to remember is that some people like to sew or otherwise create things on their own instead of purchasing someone else's cast-offs, no matter how nice. Wow. Thanks so much. I found the instructions easy to follow and the project came out great. Many more coming. I know lots of people who would love these as a gift. Link worked fine for me. Gotta make a slew of these. Will be great to have some that match my decor. I made this for my granddaughter for xmas. I filled it with different crafts and crayons, glue, scissors. She loved it! The pattern was easy to follow. I can't wait to make another!! This link is not working!!!! cant get my computer to go to instructions when I click on the link above it goes to some weird site. She wants hits off the domain ad page. How shameful and misleading. She should be banned. NOT NICE to divert us to an AD for opening a domain! Just give us the pattern, as promised. The link given in comments is good, and should be used above, where it says, "Click here for Sewing Pattern", instead of a link to an ad. Btw, this is the exact pattern that I have been looking for. I am looking forward to making it up. Thanks to Ashley for providing the tutorial. I am trying to find the fabric box pattern and the link takes me to a domain page!! HELP!! !WOULD REALLY LOVE TO MAKE THE BOX! the ladies were right when they said the 'to get pattern click on' does not work and instead of relying on someone in comments to guide people to the right place. You might do better if you just fixed it??????????????? I am not able to view the pattern. you need to fix the click on for the pattern thing, cause it doesn't work.